Dr. Piazza has expanded his training facility and staff to accommodate all of you that want to take one of these free classes. He personally assured me that every Handguns reader that is over 21 years of age and can meet the requirement of no criminal record, mental illness or substance abuse will be able to take one of these free classes. But the classes fill up; and to have the best opportunity to attend the class of your choice, you should contact him now. Following is the report that Guns & Ammo feature editor Jeff John filed on his experience at one of the free submachine gun classes. Students are drawn to Front Sight from all over the nation. Sidney Davis of Bergenfield, New Jersey shoots along side Jeanne Cecchi of Pleasant Hill, California at the free sub-machine gun course. We scribes get to do a lot of things free that are expensive or impossible for the general public. We get to test and shoot all manner of firearms and use cool gear on the cuff, so to speak. A recent weekend in October was a good example of this. I got to take a free submachine class from the world-class instructors at Front Sight Firearm straining Institute in Nevada. Free use of a Front Sight-supplied fully auto Cobray M-11 9mm submachine gun with a two-stage suppressor—and all I had to provide were eye and ear protection and a hat. Spares of those items were on hand for those who left home without. Even the copious quantity of ammunition necessary to feed a gun with a 1,200 rpm cyclic rate was provided free as well, and, boy, did we shoot. We had to hurry to reload our 32-round magazines and get back up on the firing line under the watchful eyes of the dedicated Front Sight range staff. What makes this event unique—and interesting to you—is that the same deal I got is being offered to the Handguns reader. Yes, finally you can get to do something unique that few others will ever get the chance to do—learn how to employ and shoot a submachine gun. There is no better fun than shooting submachine guns (except maybe shooting full-size machine guns) except getting to shoot submachine guns free. Dr. Ignatius Piazza, found of Front Sight, gives the students a run-down of the Cobray M-11 they will use, including its features, applications and a little history of this legendary firearm. That's right—free. 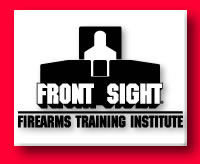 Front Sight will provide the guns, ammo, food and water for the Handguns readers who apply for the Introduction to the Submachine Gun course at Front Sight. All you have to do is get yourself there and find a place to stay. Front Sight is about45 minutes from Las Vegas, so there are plenty of hotels, motels and other fun ways to make a weekend out of it. Students graduate by firing two full magazines from the Cobrays. Jeanne Cecchi of Pleasant Hill, California fires her first magazine into the old target with the assistance of instructor Ron Danielowski. While no means unpleasant, the recoil of even the 9mm at 1,200 rpm tends to move one back a step. A new, fresh target will go up for the final magazine and the "keeper" target. This is a one-day class. You will not learn everything there is to know about sub-guns, but you will know how to handle one safely and learn how to hit with a sub-gun should that occasion ever arise. There is a four-day course for those who wish or need to employ a sub-gun tactically After a lecture on the design and features of the Cobray M-11 (open-bolt guns have their own safety rules in addition to ones we already know and respect) as well as how to employ it by Front Sight's range master, Brad Ackman, the students repair to the range and are taught to fire with discipline and accuracy Front Sight maintains a 4-to-1 ratio of students to instructors so that each student gets plenty of individual attention. The high ratio also makes for a safe and orderly range. Dr. Ignatius Piazza, founder of Front Sight, demonstrated why discipline in using the sights is important even in machine gun use and pops the myth of "spray and pray" quite effectively during his live fire portion of the lecture. Don't think this course is just a dry three-round-burst-is-all-you-can-do sort of day As a graduation exercise, students get to rip a full magazine of 9mm into a fresh target and keep the target as a souvenir of the day In between, how to employ the gun from various positions and the how and why of Morro drills is covered. Capping it all is a free pizza lunch with sodas in the main tent. After that, any who wish to stay will get to talk with Dr. Piazza about the various levels of membership at Front Sight and the benefits you will derive from joining. Even the suppressed rattle of 20 or so sub-guns discharging is impressive when the "engage targets" command is given. Sometimes it's what we don't know that will hurt us, and at Front Sight, the instructors want you to be prepared for any defensive event that comes your way I like to think I'm up on the theory and practice of the tactical employment of firearms, but these guys offered fresh insights and—better still—I got to use a firearm I'd always yearned to employ yet figured I'd never get a chance to use. All in all, it was a fun day and worth every minute. Be sure and peruse the application on the following pages! NOTE: All free submachine gun courses in the year 2000 feature Front Sight's brand new Uzi submachine guns. Click HERE to complete an application.